I’m new to the BMW forum & looking for any insight/info from current owners. I’m seriously considering buying a 2016 or newer C650 Sport. 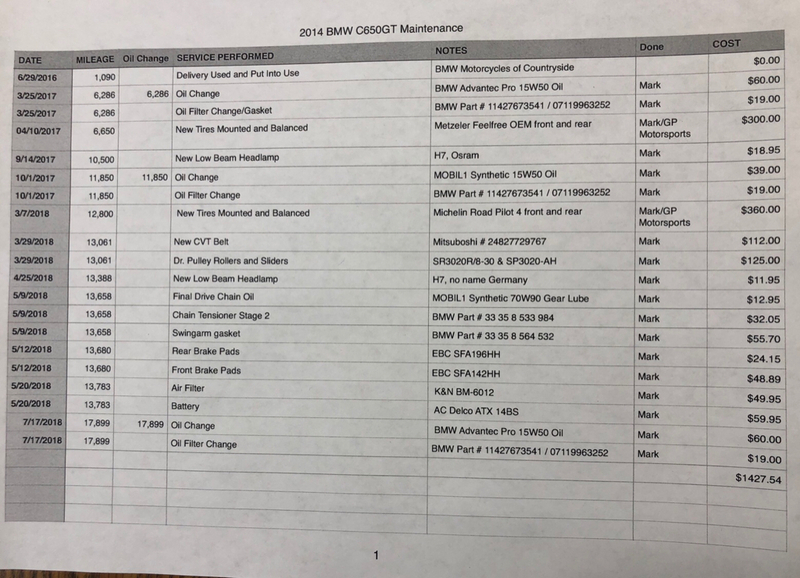 I’ve researched online for info about the BMW scooters & found lots of issues with the pre- 2016 models. Got the impression that BMW finally made big improvements starting in 2016. I’m interested in hearing from owners about dependability of 2016 & newer models. Has the stalling issue been fixed/resolved in 2016 models? Are there any other quirks or problems I should aware of? Does anyone have a C650 with higher mileage – like over 20K? How trouble free was the scooter? Do all 2016 & newer models have the hydraulic Timing Chain Tensioner? Is this new tensioner more reliable than the old version? I’m able to do most of the basic work on my Tmax such as: Change tires, change oil /air filter or spark plugs, work on the variator & change the drive belt. Other than the cost of parts on the BMW, is there any other high priced service items? Checking & adjusting the valves is the only service I might not be able to do. What is typical cost for valve service & when is it due? I realize that BMW scooters are premium priced, so I’m trying find out how reliable the 2016 model is. Other than routine maintenance will I typically find a lot of “surprise” problems that need to be fixed by the dealer. Items like remapping the DME (Digital Motor Electronics) , etc. Is the scooter worth the investment if I stay on top of the maintenance, or will it have issues no matter how well I take care of it? SJ Mike - what is your intended use? If it's commuting or puttering around town I suggest you take a look at the C-Evolution EV Scooter that BMW sells in California. Virtually maintenance free. Awesome bike! If you are going for a longer range vehicle the C650 Sport seems to have been discontinued in favor of a new yet-to-be released 400cc single. There are still some new ones around and certainly will be able to find an occasional used. Last edited by cpallenjr; 10-02-2018 at 08:11 PM. I was checking out a Burgman at a KTM dealer today, and when I mentioned to the salesperson I was also seriously considering a C650GT, he said they had taken in a used one (10k miles) and inquired as to when and how expensive the next scheduled service would be. "$2000 for the 12K service at the dealer," was the answer they found. Could that possibly be true? The valves aren't due for a check until 24K, right? What could possibly be involed to mount up to $2000? Not true. Not close to true. Almost 21,000 miles of my 2014 650GT and I’ve spent less than $1500 on maintenance on mine. Yes, I’ve done most of the work myself but nothing has really been very difficult and just needed to get a few special tools. Also some farkle type upgrades not included in this but those are optional. How do you like the Pilot Road 4's? I put them on and they seem to work brilliantly..
Great improvement over Metzelers. Already gone 2K more than Metzelers and should go another 2-4K. Great grip dry and more wet weather grip. Bad thing is I bought an RT and probably selling 650GT as no room in garage and wife doesn’t understand need for 2 “toys” so may not see how long they really last.